Northzone, the lead investor in digital music companies like Spotify and X5 Music, has pumped $3m into Oslo, Norway-based social jukebox app maker Soundrop. Northzone’s Torleif Ahlsand will join Soundrop’s board. Soundrop is all about social music discovery through hosting what it refers to as ‘listening hangouts’ within digital music streaming service Spotify. In May, the startup says its users held more than 3.3 million listening sessions, created more than 7,000 rooms and listened to almost 60 million songs. Some of the official rooms that were opened were for renowned artists such as Carrie Underwood, Kelly Clarkson, Iron Maiden and Sigur Rós. We had an interesting chat with Inge André Sandvik, CEO and co-founder of Soundrop, to learn more about the service and the company’s plans. TNW: We have to ask this first. How is Soundrop different from Turntable.fm? 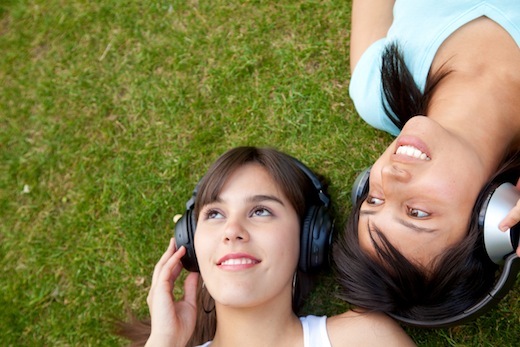 Soundrop’s vision is to help people discover and listen to more music. The biggest difference with other services is that Soundrop is designed to help the user both discover and influence in real-time on what’s being played. Soundrop is enabling the user to become very engaged in the creation of the social playlists instead of just listening to DJs. Most people use music as a background activity, and Soundrop is really designed to meet both needs. TNW: When was Soundrop founded, and were did the original idea come from? Soundrop has been bootstrapped since the launch in November last year. We started the coding early Spring and waited patiently until Spotify launched its platform before we revealed what we were up to. Seeing all the benefits of building value on top of such a great platform as Spotify has really paid dividends for us – both from a product and market potential perspective. TNW: Isn’t it dangerous for any company to rely so heavily on a third-party platform, whether it be Facebook or Twitter, or in your case Spotify? Good question and I would agree with you if we were just an application. Soundrop is however a powerful platform of its own and the application we have made in Spotify is really just a example of what we can do with it. We have a service-oriented architecture and can work on top of any content and any service. We are also now going to offer APIs to others to create or integrate their apps with Soundrop. TNW: Do you see yourself expanding to other music services with open platforms? We have received invitations to do so, but we think that there is a lot for us to still do on the Spotify platform before we spread our focus. We see a lot of potential, but we need to be able to really give it our very best when we do it and we are simply not ready for that yet. TNW: How do you plan to monetize the service? Montization is not a problem when you have engaged users. We just need to be very careful and listen to what our users and partners want. We have tested out with the labels certain new features that will enable revenue streams. It’s looking promising, but we have quite some work ahead of us to really scale that. TNW: What’s next on the product roadmap? TNW: Why did you need to raise outside funding? It’s a dream come true for any entrepreneur to see a vision and idea be loved by real users. It’s also a dream come true to have VCs believe in that vision and be able to back it up with funding. I am very proud of what the team has accomplished, but we have to admit that we are not wizards that can do it all. We have built Soundrop without a designer and front-end developers. With the funding in place, we can really chase our dreams and get more hands on deck to execute on our ambitious roadmap. TNW: What’s your biggest challenge as a business right now? The biggest challenge is us being able to scale the team and get more world-class people to join us on our quest. We feel lucky and thankful to have a great team that works so well together, and will continue to do all we can to strengthen and take care of the team. There are so many opportunities out there, so it’s really just up to ourselves to execute on them. TNW: Considering Northzone is also an investor in Spotify, do you think this is a lead-up to a future acquisition by Spotify if targets are met? That has never been discussed and that is a very truthful answer. We have no plans to get acquired by anyone. We have all our focus on the users and what our customers want. We obviously see all the benefits of being on a bigger and stronger team, but I think that we can do everything we plan to do with the resources we have and will get when we now get the funding in place.